the collection is going to be named after yayoi kusama’s retrospective: love forever. 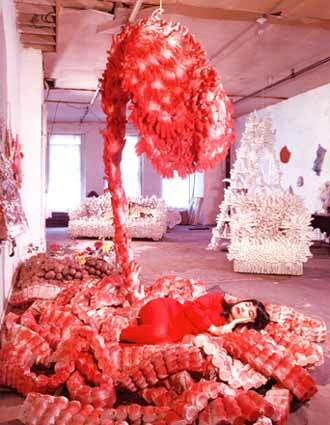 Below are images & excerpts from an article on Kusama San. The example here, My Flower Bed (1965-66) is made of painted, covered mattress springs and stuffed gloves. The work suggests, as do the sculptures pictured in the background, a fragmented biomorphism and a lush and out of control blooming. 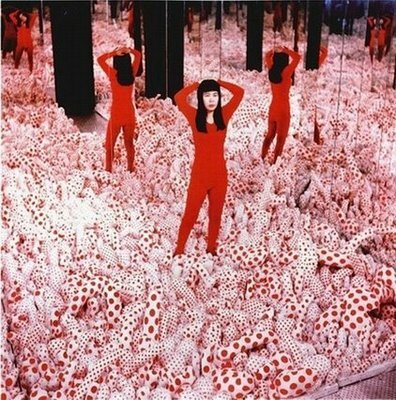 Yayoi Kusama’s mental illness began in childhood when she began hallucinating the dots, nets and flowers which subsequently appear in her paintings and sculptures. Today, she voluntarily resides in a mental institution in Japan. She has recently had a retrospective, Love Forever, at the Museum of Modern Art in New York.